For referrals to Dr. Konstantinos Charitakis, please call 713-500-8828. 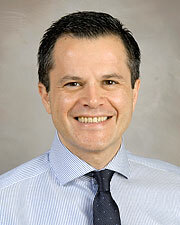 Dr. Konstantinos Charitakis is a board certified Physician and Assistant Professor of Medicine in the Department of Cardiology at McGovern Medical School at The University of Texas Health Science Center at Houston (UTHealth). Board certified in Internal Medicine, Cardiovascular Disease, and Interventional Cardiology, Dr. Charitakis specializes in angioplasty and stenting. His clinical expertise extends from the performance of complex complex coronary interventions to endovascular treatment of peripheral disease. He is committed to training the next generation of interventional cardiologists and teaches medical students and residents on all levels.